The last few years have seen a resurgence of interest in the end fed half-wave wire EFHW antenna. 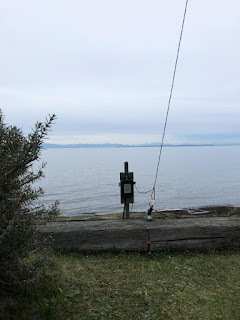 A half-wave at the lowest band of interest will also work well on all harmonically-related bands which has become particularly attractive to those wanting a quick portable wire antenna. 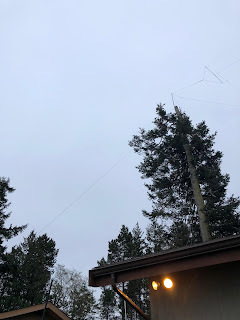 It looked like an interesting antenna to try, as I was in need of a good 80m radiator and following several days of fine summer-like weather, I was able to get my new 80 / 40m wire vertical completed ... a half-wave on 80 and a full-wave on 40m. It’s built as an inverted-L, going up 80’ and the remaining 50’ being horizontal at the same height. It’s fed at the base through an impedance matching transformer and was pruned for the CW end of the band. There's always a great sense of anticipation when first testing a new antenna and the experience only comes around once in a rare while ... it always brings back memories of my teenaged ham years, quickly scrambling off of my parent's steep three-story roof and tuning-up the DX-20 to see if the latest antenna was going to be something special. Yesterday was similar, except for the roof-top scrambling and the old DX-20. By mid-afternoon everything was wired up ... but before waterproofing all the connections against the west coast rains, I went to the shack and warmed-up the FT-1000mp, setting it for exactly 10W out. Tuning across 40m, I immediately heard fellow NRR’r Howie, WB2AWQ down in Reno, calling CQ on 40m with one of his military transmitters. He came back immediately and we had a short chat, so at least I knew the new antenna worked! Having waterproofed all of the connections, I ventured to the shack once more, now just 45 minutes before sunset. I’ve always found that a quick way to gauge relative antenna performance is listening for my low-power signal via the vast KIWI online SDR network. With the power still set at 10W on 40m I listened on several east coast SDRs, from NH, PA, MD, NY, VA and immediately heard a surprisingly good signals on all of them. Even at 5 W, the signal was copyable. Several of them produced an audible copy when I reduced power to just 1W. I then tried two SDRs in Brazil and immediately heard the 10W signal again! How about KH6 ... still late afternoon out there? Yes, easy copy in Hawaii as well. 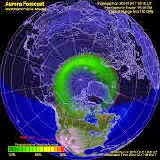 Dare I push my luck and try one more ... one of the SDRs in Iceland? I almost fell out of the chair when the 10W signal was good copy there as well ... still 15 minutes until sunset and with bright sky outside the shack window. One last thing to try was 80m although it was still very early here for 80 ... the SDR in MD returned a nice copy at 10W to complete my quick round of pre-sunset testing. From these early observations it would appear that the new antenna is working well but I had yet to do any A-B comparisons with my benchmark best performer, a 40m half-sloper which will be hard to beat. The 40m half-sloper has always outperformed any other antennas that I have tried. It's the same one that I completed my Tuna Tin 40m W.A.S. on, so its been well tested. The following evening, I had a chance to A-B test the new antenna, listening on the Kiwi network once again with my power set at 10W. Unlike 1/4 wave verticals that require a fairly robust counterpoise / radial system for effective operation, the counterpoise requirements for a half-wave are far less-demanding. Mine consists of about fifteen short turf-pinned radials and the first 50' of the coaxial feedline's shield. A common mode choke (CMC) is installed on the feeder at the 50' point, keeping any RF out of the shack and the rest of the feedline from radiating. I was actually pretty surprised at these results but how they will relate to everyday operating is yet to be determined. My main goal was to get a good-performing 80m antenna and anything that works well on 40 would be a nice side benefit but not really required. Unfortunately I don't have another 80m antenna to run some A-B checks with but from what I can tell, performance on 80m seems to be good. If you are on Facebook, there is a lot of good discussion and information available on the End Fed Half Wave Antennas group. Good read! I wish I could get that kind of height on my EFHW. I have raised mine a few times and each time I can see the difference theadded height makes. Nice post, as always. Great location you have! I started my ham career with EFHW antennas, and they are pretty good and as you say, flexible in deployment. That said, EFHWs are nowhere as good as a quarter wave vertical for DX purposes, even when erected vertically. Against a delta loop for 20m, for example, I found an EFHW will be a good 3dB down. That said, beyond 30m, it becomes impractical to stick up a 1/4 wave vertical or delta loop, and you need a bagfull of wire to cover the various bands as they change. Certainly a useful and adequately effective antenna. Thank you both for your comments. PHOTON, I need to do more reading about 1/2 wave vs 1/4 wave radiators, particularly verticals. I noticed with my 1/4 wave verticals on 40m that I always have a good signal out on the east coast but, as expected from this type of radiator, coverage in the nearer and central states was not as robust. I'm hoping that the 1/2 wave might yield a higher angle to provide a better signal into the closer and central states and still a useable signal out on the east coast. Time will tell. I may eventually have to go back to the 1/4 wave radiators. There's no free lunch. Directivity is the only source of "gain". But ground loss is present even with a half-wave vertical, and certainly more so with a quarter wave vertical. Why don't you try both and let us know how they compare? One way I can think of would be to put a parallel resonant trap half-way up a half wave vertical. Short it and you have a half-wave vertical. Leave it unshorted and you have a quarter-wave vertical whose pattern and impedance might be altered a bit by that extra wire up above it, but I doubt it would alter it much. Surely EZNEC would tell you. Doing it this way with a single wire would avoid problems comparing two wires in slightly different places, and the problems posed by one wire interfering with the behaviour of the other. Hi David...will check out your links and many thanks! That's an interesting idea but shorting and unshorting a trap doesn't deal with the impedance transformer at the base, which is matching to ~2500ohms. I've had quarter wave vertical groundplanes in this exact same location and the 40m one was pretty much dead-even with my half-sloper (which also models out similarly to a 1/4 wave monopole so with the present end fed fullwave inverted-L on 40 being equal or slightly better than the sloper, there's not a huge difference. My initial observations are that the end fed has a higher take-off angle as I seem to have a better signal into W6 than ever before...either that or short term propagation has favored this path. The groundplanes and the sloper always had great signals into the east coast but not so much into central NA...time will tell.